The Remo Emperor Hazy Snare Side is designed for heavy hitting, and gives a a deep warm sound with low sustain. The Remo Emperor Hazy Snare Side is a resonant snare drum head made with a single 5mil hazy ply. This is thicker than standard 3mil resonant snare drumheads (e.g. the Ambassador Snare Side or Evans 300). Due to the thicker design, the overall sound is deeper and the snare wire response is reduced. The “hazy” film is semi-translucent, giving this drumhead a nice look and adding a slight warmth boost. 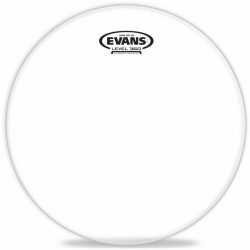 The thick 5mil ply adds even more warmth, giving this drumhead a strong overall focus on mid-range and low-end frequencies. On deeper snare drums (6.5″ or more) this is most noticeable, and can sound great. If you play a lot of lighter snare articulations, the Emperor Hazy Snare Side probably won’t be sensitive enough for the job. Where this drumhead really shines is with heavier playing and loud environments. It is thick enough to handle long-term heavy abuse, and provides good depth and fullness to your snare drum sound when hit hard. The thick ply of the Emperor Hazy Snare Side also means that ringing overtones and sustain are reduced. When hit hard, the sound is big, cracking, and short, with a lot of attack followed by minimal ringing. 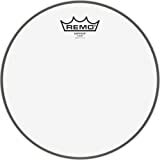 The Remo Emperor Hazy Snare Side is a great resonant head choice for heavy hitters wanting a deep, short snare drum sound. 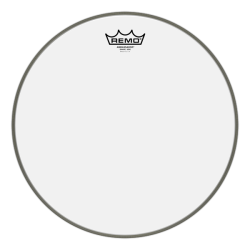 For low volume playing, be aware that this drumhead can lack tone and can sound boxy. Tip: take a look at the Ambassador Snare Side or Evans 300 if you need a snare side head that responds better to softer touches. Note: This is a resonant snare drum head which is designed to be used on the resonant side (bottom) of the snare drum. 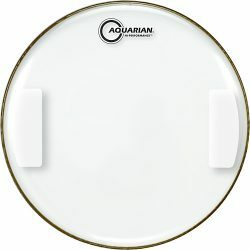 It is not recommended to use this drumhead as a batter (top) head, as it can damage more easily due to the thinner ply. 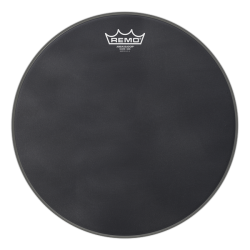 Remo Emperor Hazy Snare Side Drumhead, 13"
Note: The Remo Emperor Snare Side is not the same as the regular Remo Emperor. The Emperor Snare Side is much thinner, and is designed to be used as a resonant drumhead only. The regular Emperor is a 14mil drumhead, unsuitable for use as a resonant snare drumhead. If you don’t know what any of this stuff means, head over to the Drum Sound FAQ!